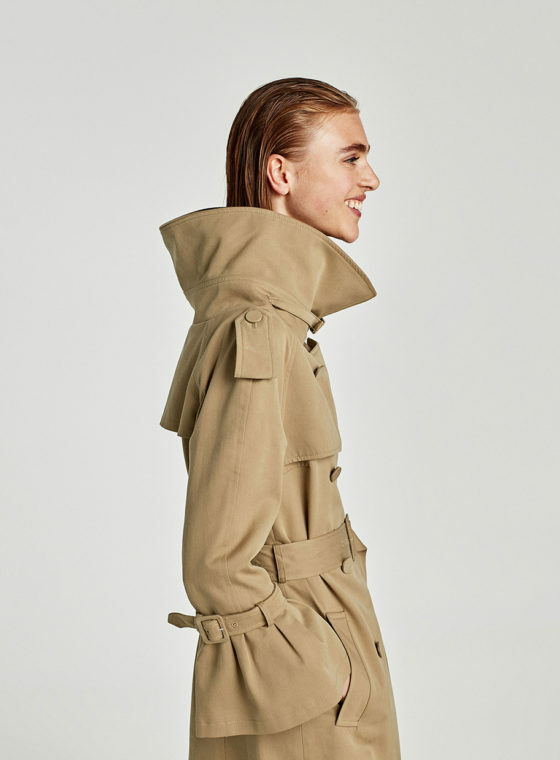 We pretty much want to put jewels on everything these days, including the ever classic trench thanks to Christopher Bailey. 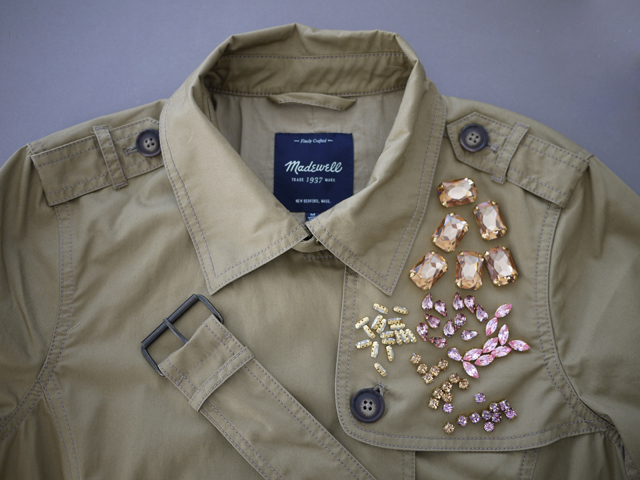 Burberry’s iconic trench coat got a dazzling makeover with jeweled florets – the highlight of his resort collection! 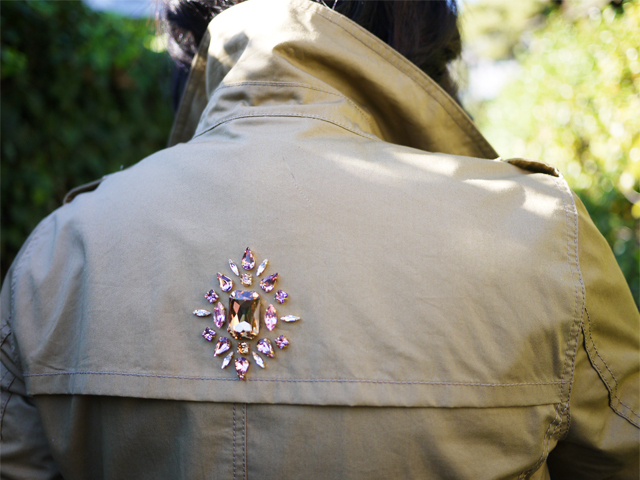 Sparkly crystals + our favorite type of outerwear?! This calls for a DIY, of course. This may not be the easiest of tutorials but it’s so worth the time and effort, if you are so inspired. 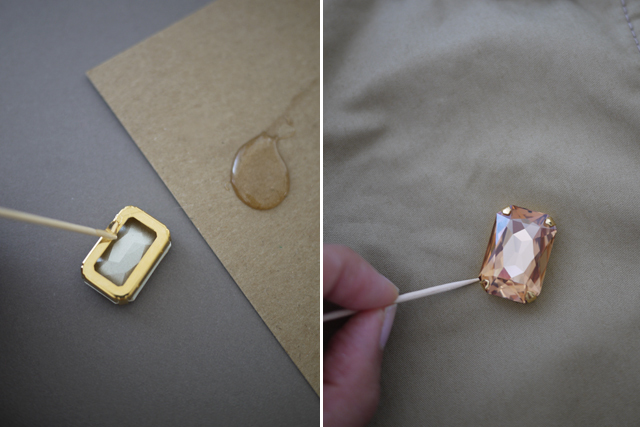 *** Honestly, the most challenging part of this DIY is picking out the right crystals. I used Swarovski crystals here because if I’m going to spend the time and effort into a rather difficult DIY, I want to use high quality materials. For this project, I roughly sketched out a pattern on a piece of paper with colored pencils. Not only did this help determine the colors to pick, but the shapes as well. The next step is to determine the sizes. This will be based on availability from whomever you are purchasing crystals from – Dreamtime Creations, I’ve found, has the widest assortment. It’s good to have a small ruler on hand for this. Once you have all the crystals picked out in colors, sizes and shapes that are close enough to your design, it’s time to pick out coordinating sew-on settings. Phew! Now that the hardest part is done, you just have to sit and wait for the goods to arrive in the mail to get started! Set the stones into the metal settings. 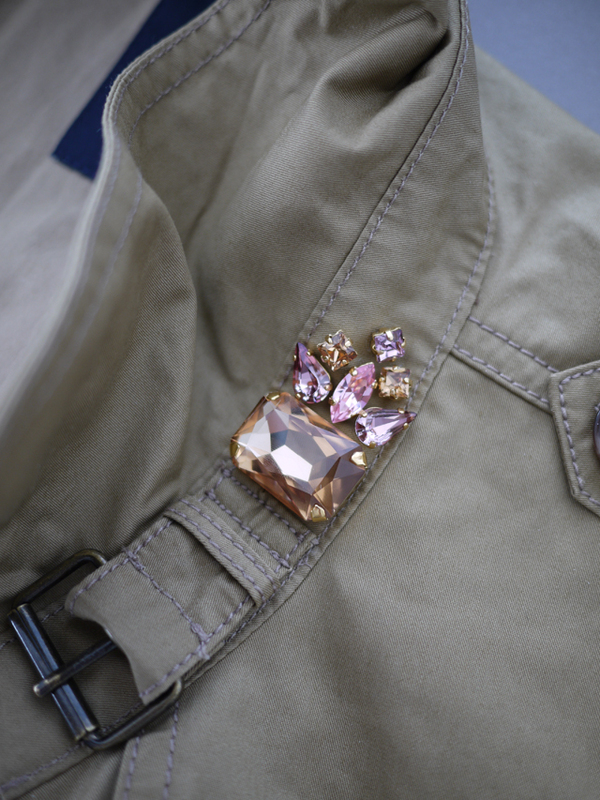 Use a pair of pliers to close the prongs onto the crystals. Lay out the pattern to make sure it’s to your liking. Use masking or painter’s tape to mark where the crystals will be attached. 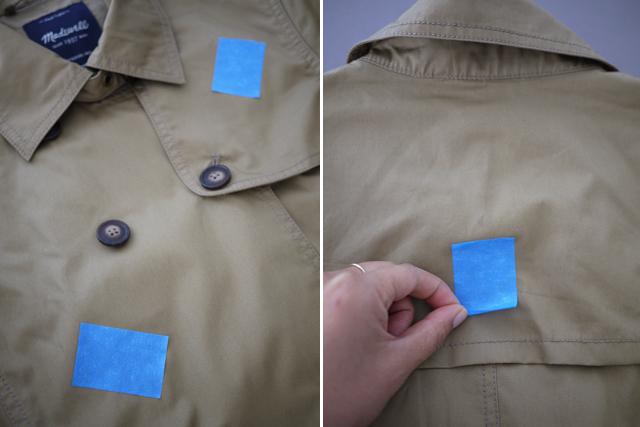 Make sure the areas won’t be covered or placed in awkward areas – try the coat on to assess the placements. I put 5 emblems in the front and one in the back. Squeeze a dollop of E6000 onto a piece of cardboard. Use a toothpick to apply a tiny bit of glue around the metal setting. Be sure not to get the glue on the back of the crystal since you will eventually need to sew through the setting. The glue simply ensures that the crystals stay in place before you begin to sew. Use pliers and toothpicks to help adjust smaller pieces. Allow the glue to dry completely. Thread a needle with like-colored thread. Tie a double knot at the end and pull the needle up from the inside of the coat. Thread it from one hole in the setting to the opposing hole. 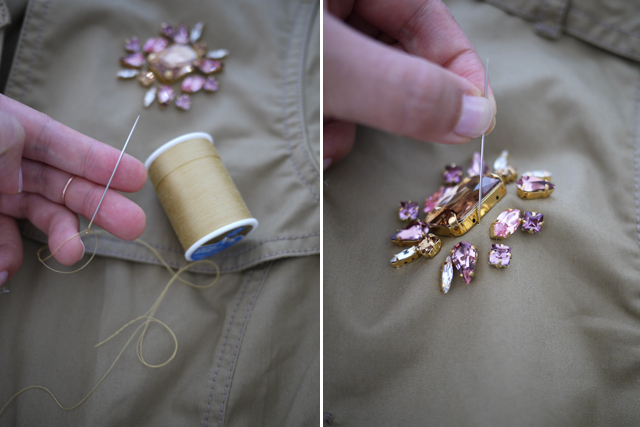 Work in a criss cross pattern, sewing each crystal in place. This is definitely the most tedious part but just remind yourself it’s the final step! I did it while watching TV. 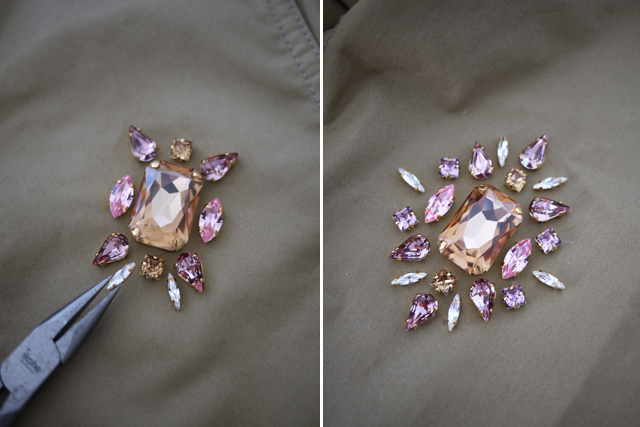 Add a few leftover crystals to the inside of the collar . . .
. . . for when you wanna pop that collar! Don’t forget to add that bit of sparkle to the back! 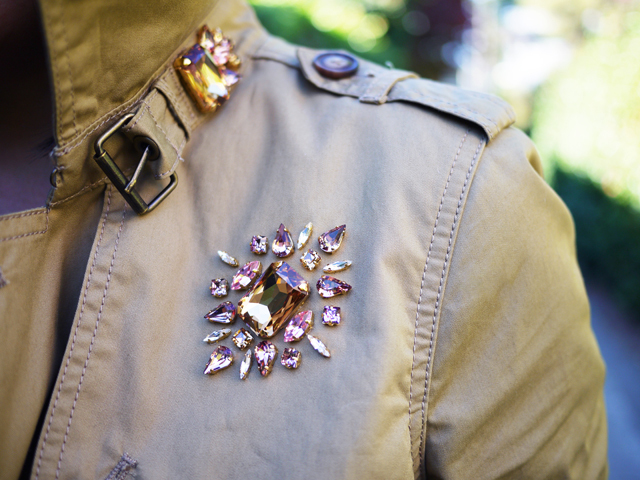 Your Burberry-inspired jeweled trench is done. To clean, simply dry clean. I love the color palette that you chose, super chic. I’ll have to try my hand at doing a similar DIY like this on an old coat that I own. This is one of your best DIY love it! This is fabulous!!! I just made a jeweled tshirt for my daughter. She loves it and it really isn’t that hard. Like you said, it’s tedious, but it’s so worth it. Erica, you have outdone yourself. Truly stunning! So original your DIY,I love your new trench!!! Love this…I’ve got to do more DIY projects! 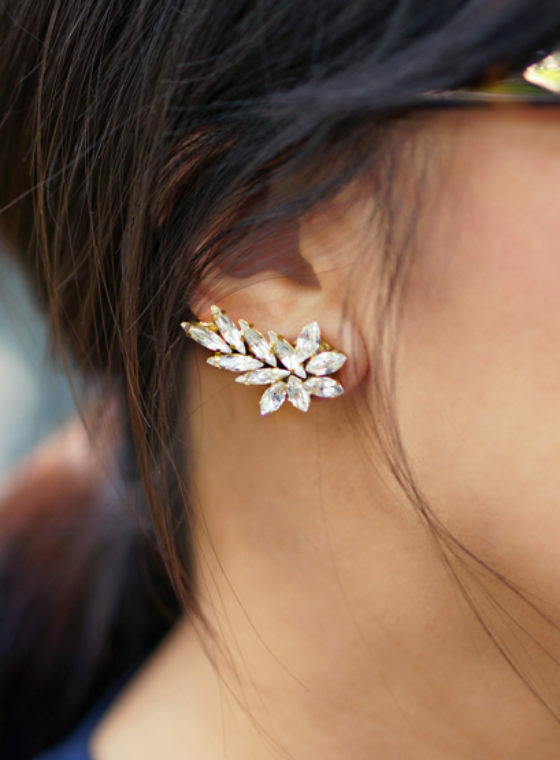 This is like a grown-up, stylish version of those rhinestone tattoos everyone went crazy for in middle school! 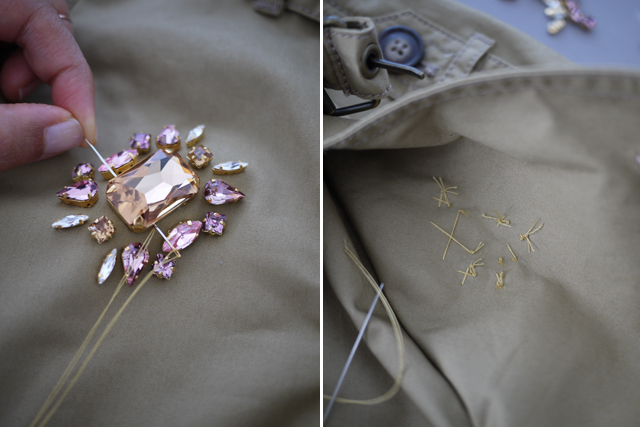 I love the Burberry trenches, this is a great DIY! wow what a STUNNING diy!! This is so pretty! I want to do this to one of my boring sweaters… Need crystals on everything! Love this DIY! I am kind of obsessing over it and think I have to do my own version ASAP. It will take me forever to make any rhinestone choices. 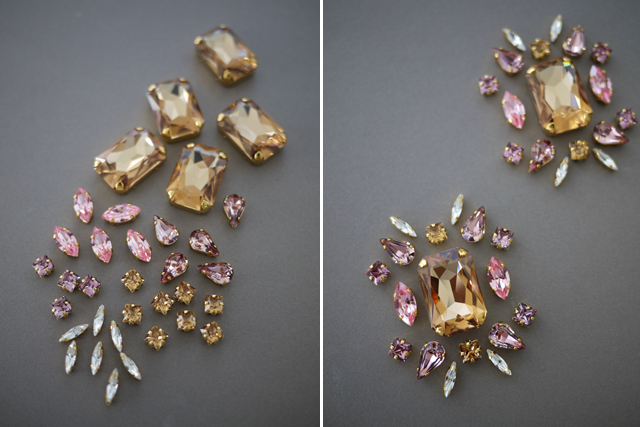 Is there anyway you could give the size/shape/name of the swarovskis used for this project? The link to the website is a a little hard to navigate…they just have so many hundreds of crystals it’s hard to see which ones you used. So excited for this project! thanks!! This is adorable!!!! Where did you buy these crystals you used in the project? Your jacket is beutiful. 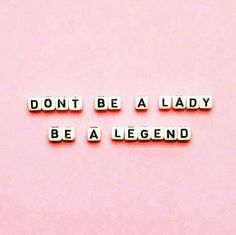 I have been looking at several on Pinterest to get ideas for a jacket and jeans. I know I’ll sew beads or pearls on, but just had a thought. Would it work, or not, to use a dab of beading to fabric glue (can’t remember the name of the product) under the bead to hold it in place,let it dry, then t sew them on ? I know there’s a glue people use for this, but I don’t see that being a lasting thing compared to sewing. I don’t think I could ever do the beautiful work you did, but I’d like to try and I know the beads will move all over for me. I’d appreciate any thoughts on this.